When I was a little girl I used to wish I was older all the time. I would always dress older then my age, wear more makeup than I needed, and speak like an adult. I was jealous of my elders, believing they never had to be concerned about silly things that consumed us young people, things like APPEARANCE. I was of course wrong, but what did I know? I was just a kid, lol! Now that the wrinkles are setting in I find myself angry for not taking better care of my skin as I aged. Hind-sight really is 20-20! 100% Pure Hyaluronic Acid Serum has helped to lessen the crows feet and fill in the smile lines. I can't complain about how smooth it leaves my skin either. I especially like using it as a primer under makeup! 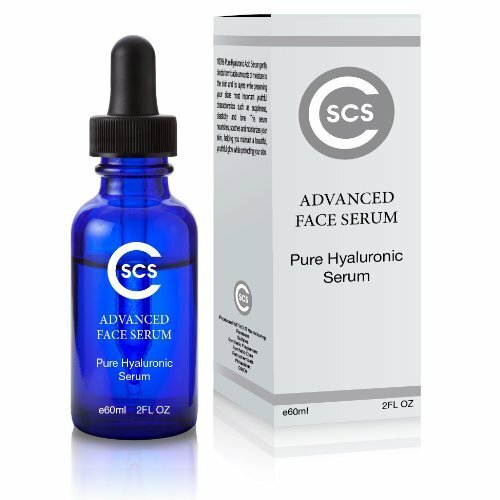 I tried 100% Pure Hyaluronic Acid Serum because they sent me a free sample in exchange for sharing my honest opinion about their product, and I really think they are great. • NATURAL & ORGANIC; the CSCS Hyaluronic Acid Serum has been formulated with high-quality hyaluronic acid that has been scientifically proven to possess fill-in properties to help improve skin texture and brightness for a youthful, radiant appearance. • MOISTURIZER; our hyaluronic acid serum offers the highest level of moisture to your skin, which helps retain its firm texture, plumped aspect, and glowing look. Apply it to your face, neck and around your eyes, and enjoy smoother, brighter skin that really turns head! • GENTLE FORMULATION; formulated with gentle ingredients and NO fillers, preservatives, GMOs or allergens, the CSCS Hyaluronic Acid Serum can be safely used for any type of skin, as it's the very best product for sensitive skin and an outstanding remedy for oily skin! • ANTI-AGING; much to your delight, our hyaluronic acid serum has been proven to make a difference in how your skin looks thanks to its anti-aging properties. Use it to get rid of wrinkles, fine lines, age spots, and to give your skin a fuller, smoother and glowing appearance.